President Barack Obama is making good on his pledge to politicize gun violence. The package of gun-control executive actions Obama will formally announce Tuesday has pushed the contentious issue to the forefront of the 2016 presidential campaign, just weeks from the Feb. 1 Iowa caucuses. While Republicans and Democrats are deeply divided on the issue, both parties see Obama’s actions as an opportunity to generate enthusiasm among primary voters. But in a general election, the gun debate becomes a blurrier political proposition. Public opinion polls show Americans overwhelmingly support expanding background checks for gun purchases, but are more divided on the broader question of stricter gun laws. The gun-control advocacy movement has gained wealthy backers, including former New York City Mayor Michael Bloomberg, but the National Rifle Association remains one of the most dominant forces in American politics. “It’s an issue that both (sides) are really going to want to talk about for the next couple of months, but I don’t know how much they’re going to want to talk about it in the fall,” Matthew Dowd, a former political adviser to President George W. Bush, said of the eventual presidential nominees. For now, Obama’s gun actions are a central topic as candidates crisscross Iowa, New Hampshire and other early voting states. On the Democratic side, front-runner Hillary Clinton has unveiled her own proposals for gun-control executive actions and enthusiastically endorsed Obama’s measures even before the president’s official announcement. “I know that a Republican president would delight in the very first day, reversing executive orders that President Obama has made,” Clinton told voters in New Hampshire. The cornerstone of Obama’s executive actions is a background check requirement for guns purchased from dealers even if they’re bought online or at gun shows. The new federal guidance aims to narrow the so-called gun show loophole that allows some purchases to occur without a background check. The emphasis on gun issues marks a shift for Democrats, who have shied away from the subject in recent presidential elections, not only because of the NRA, but also due to competing views within the party. Clinton and Obama both treaded carefully on guns when they faced off in the 2008 Democratic primary, and the president didn’t attempt to pass congressional legislation until the shooting of elementary school students in Newtown, Connecticut, which occurred about a month after his 2012 re-election. Democratic losses throughout the South, however, have narrowed the number of elected officials in the party who oppose gun restrictions. Gun-control backers also point to shifts in public opinion and the rise of well-funded advocacy groups as reasons Democratic candidates can campaign on the topic with fewer electoral risks. Actions to expand background checks, for example, have broad public support. A CBS/New York Times poll conducted in October found that more than 90 percent of Americans favor requiring background checks on all potential gun buyers. Bloomberg has pumped millions of dollars into gun-control advocacy efforts, including donations to candidates who support more restrictive measures. An organization founded by former Arizona Rep. Gabby Giffords, who was badly wounded in a 2011 shooting, also has raised millions to promote gun control measures. Surveys have shown that gun-control supporters lag those who favor fewer restrictions on most measures of political activism. During the failed legislative efforts in 2013, the NRA mobilized its members to flood Capitol Hill with phone calls and letters urging lawmakers to oppose the White House-backed measures. Still, Republicans know that while opposing nearly all restrictions on gun laws may be the only acceptable position for many GOP primary voters, it could be less attractive in a general election. 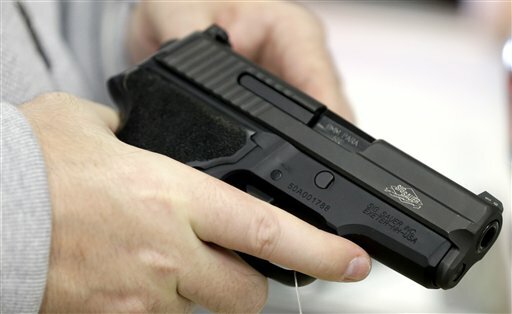 Associated Press-GfK polls conducted in October and December found 58 percent of Americans favor stricter gun laws. That’s up slightly from 52 percent two years ago. Associated Press writer Scott Bauer in Boone, Iowa, and AP News Survey Specialist Emily Swanson in Washington contributed to this report.